US - Frank and Louie, a gray feline with two mouths, two noses and three eyes, just turned 12 years old and is the world's oldest, living two-faced cat. Sara Wilcox, a Guinness World Records spokeswoman said he is the "longest surviving Janus cat," referring to the name coined by British zoologist Dr. Karl Shuker, based on the two-faced Roman god of transitions, gates and doorways. Frank and Louie has craniofacial duplication, an extremely rare congenital condition. The disorder, also known as diprosopia, can cause part or all of an individual's face to be duplicated on its head. It has been recorded multiple times in the domestic cat, but few two-faced kittens survive into adulthood, Wilcox said. Frank and Louie was born on September 8, 1999. His remarkable life will be commemorated in Guinness World Records' new 2012 edition, Wilcox said. The cat's owner, a woman only identified as Marty, lives near Worcester, Massachusetts. She was a veterinary technician in 1999 when a day-old, two-faced kitten about the size of her thumb was brought into her clinic to be euthanized. 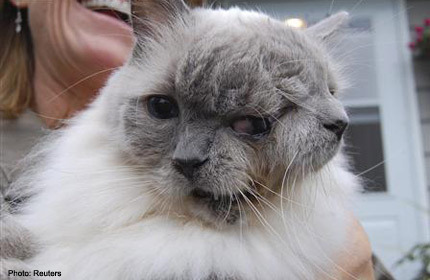 The life expectancy for a two-faced cat is about four days because they usually suffer from other disorders. "When he was first born, every day was a blessing," Marty told a local radio station on Tuesday. She immediately adopted Frank and Louie. The cat has one brain so both faces act in unison. Two of his eyes -- the outermost ones -- are normal, while the middle eye is larger but doesn't function. The cat eats on the right side, using Frank's face, which is connected to his esophagus, while Louie's nose twitches at the same time, his owner said. Marty told the local radio station that the cat is more like a dog because it walks on a leash and loves car rides."